“Hari ng Telebisyon at Pelikula” Coco Martin returned to Paradise Farms Elementary school in San Jose Del Monte, Bulacan to the glee of the gathered children and faculty. This marks the 4th visit for the Ang Probinsyano star to Paradise Farms Elementary School, with each visit marked with giveaways and goodie bags for the kids. 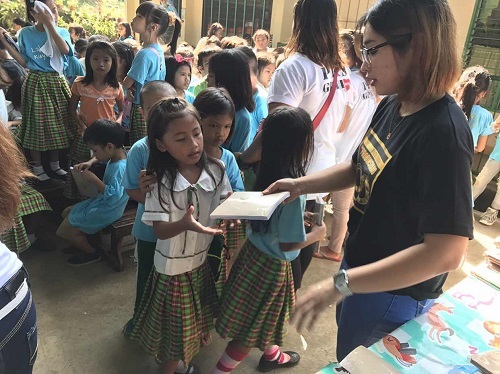 This time around, the 700 students were delighted to receive school packets containing notebooks, pencils and sharpeners, as well as a hot lunch of fried chicken and fruit juice. Coco Martin addressed the children gathered before him in the school’s covered court, speaking candidly and from the heart, encouraging the children to do well in school, and to listen to their teachers and parents. Martin also reminded the children to play an active role in the improvement of the nation, since they would be the future of the country. Martin then took the time to take pictures with the students and teachers, wading into the crowd to exchange high-fives and humorous remarks with the adoring fans. Coco Martin also visited the school’s new library / computer room, a section of which was constructed with tiles and other materials that Martin had donated. Truly, though it might have been the 4th visit to the school, Coco Martin and the rest of the FPJ Ang Probinsyano team along with Lingkod Kapamilya, ensured that each trip would be just as memorable as the last.